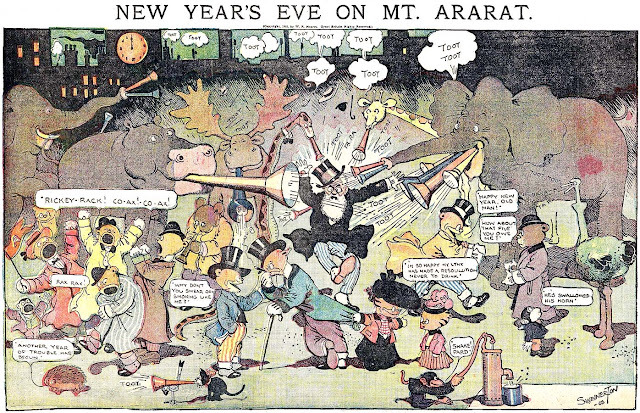 January 1 1908 -- Neat coincidence that we just happen to be covering the Herriman cartoons published exactly 103 years ago today. The top cartoon is about the Attell-Moran featherweight title fight that will come off later in the day, and the second is for the Rose Parade, already an institution in Pasadena. Thanks as always for Herriman Saturday! 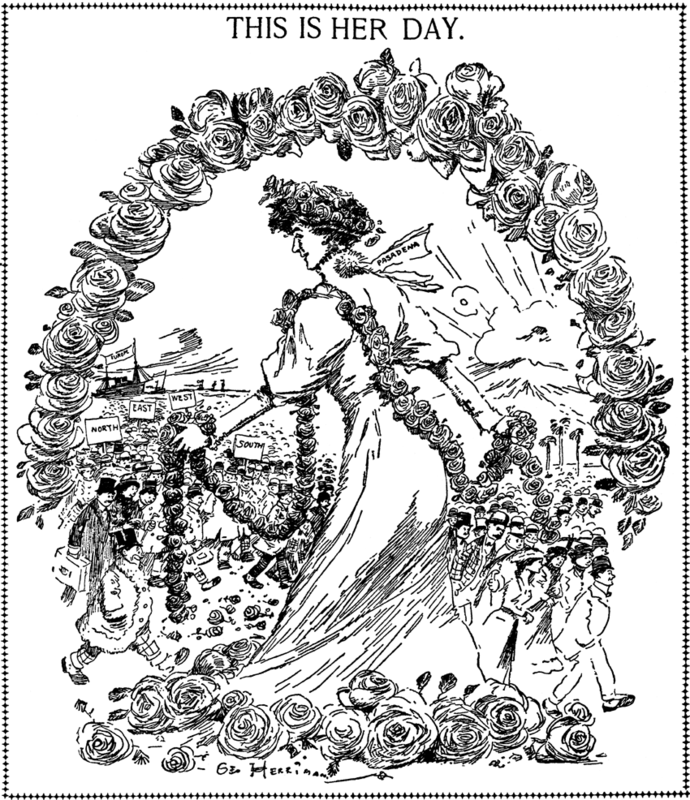 The Rose Parade has a strange historical twist that I'm still trying to figure out. One of the founders of the Rose Bowl is Arnold J. Bertonneau, who, I think, is part of the prominent Bertonneau family that came to Los Angeles from New Orleans. The Bertonneaus and Herrimans were friends and political allies in New Orleans and they kept up their friendship in Los Angeles. Yes, Michael You are correct about the Bertonneau connection. Any information you want about the Bertonneau Family can be gleaned from Dr. Thomas F. Bertonneau, professor of American Lit. at SUNY Oswego. Tom and I grew up together in Northeast Los Angeles. I recently visited Tom and his family and was regaled with stories about his Creole Bertonneau lineage. BTW, my own father was a cartoonist, too: Carl Fallberg. Best wishes for a Happy New Year! 1902 Mount Ararat Sunday courtesy of that always prepared holiday maven, Cole Johnson. Here's a magazine cover series that doesn't quite fit the standard mold of the era. The lion's share of these series were romances, whereas Miss Aladdin is a fairy tale fantasy somewhat in the tradition of Little Nemo, albeit featuring the de rigeur pretty girl. The series featured art by Virginia Huget, a semi-regular on these cover series (see, for instance, Double Dora and Babs in Society). I like Huget's art, but frankly this series looks to have been a bit of a rush job for her. The series was written by J. Kenneth Jonez in his only known appearance in the funnies, or, for that matter, in any capacity anywhere. Mr. Jonez has the honor of being a mystery even to the all-seeing eye of Google. This rare magazine cover series was syndicated under Hearst's King Features brand and was running by at least March 1929 and ended sometime in May of that year. Can anyone supply exact start and end dates? A story book for girls titled "Miss Aladdin", written by Christine Whiting Parmenter, was published in 1932 by Thomas Y. Crowell, New York. 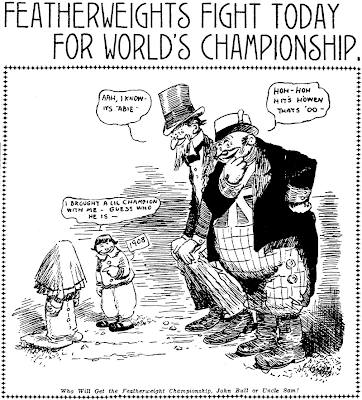 In 1934 it was serialised by Western Newspaper Union. 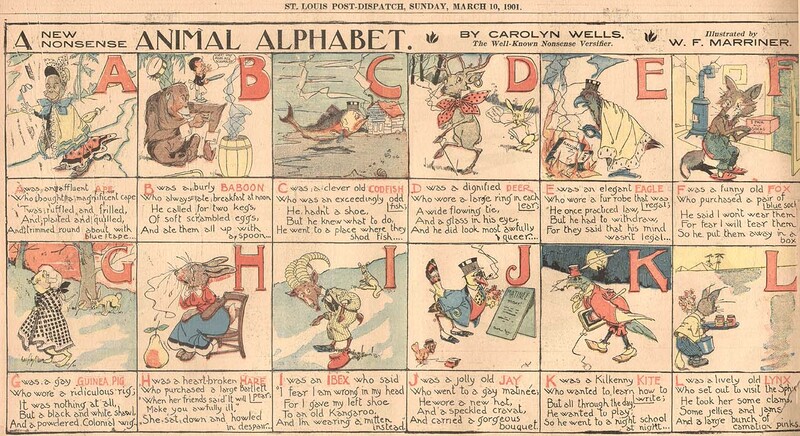 This and the cartoon, however have nothing to do with each other, it looks like the term was a once common phrase assigned to clever little girls. Here's a series that made it only two episodes. Given the length of the alphabet there really wasn't anywhere else to go after the second episode. Animal Alphabet ran on March 10th and 17th of 1901 in the New York World. 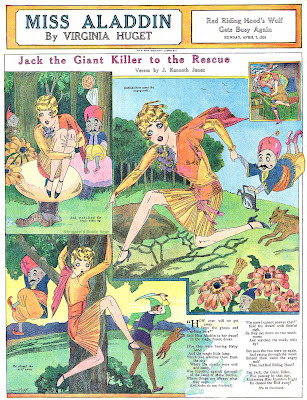 It marks the first known writing credit for a Sunday funnies series to Carolyn Wells, who later penned the great Adventures of Lovely Lilly, and many magazine cover series, including Flossy Frills. Am I bringing too much of a 2010 sensibility to this or is Ms. Wells doing a little not-all-that covert gay-bashing in some of the verses here? The artist is the always delightful William F. Marriner, who did a very short stint at the World, only about eight months in 1901 (and he moonlighted with McClure part of that time). Only a few of Marriner's series have been covered on the blog thus far, a criminal oversight I'll work on correcting. Here's Johnnie Bostonbeans and The House of Mirth. Can you tell me what the hare's saying in D? On the original hi-res scan the tiny text is legible. Unfortunately not all that interesting -- "Well, Wouldn't That Bump You?" OK, I have no clue what that means! I guess it's 1901 slang for... ? Thanks for the detective work! Hope you all had a good Christmas and Festivus! I for one had enough holiday cheer to keep me warm despite a really long cold snap here in Florida (yeah, I know, all you folks up north feel terribly sorry for me). So here in the afterglow of another holiday season, let's have one more Christmas feature before we put this one to bed. 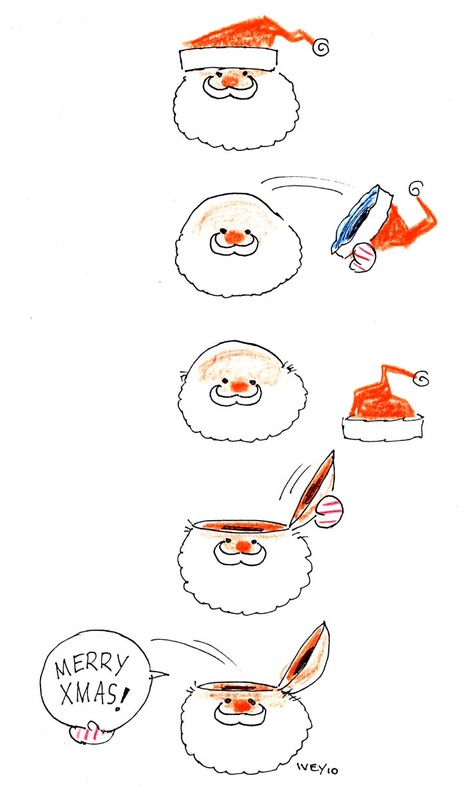 Here's the first two episodes of Songs of Christmas, the NEA Christmas strip for 1951. It ran daily from December 3 to 22. Walt Scott, who did many of NEA's specials, contributed an interesting one about the origins of various Christmas carols. As usual, when Scott does something serious he switches over to his straight illustration style, very polished but rather bloodless to my eyes.